Posted 2:13 pm by Administrator & filed under News. 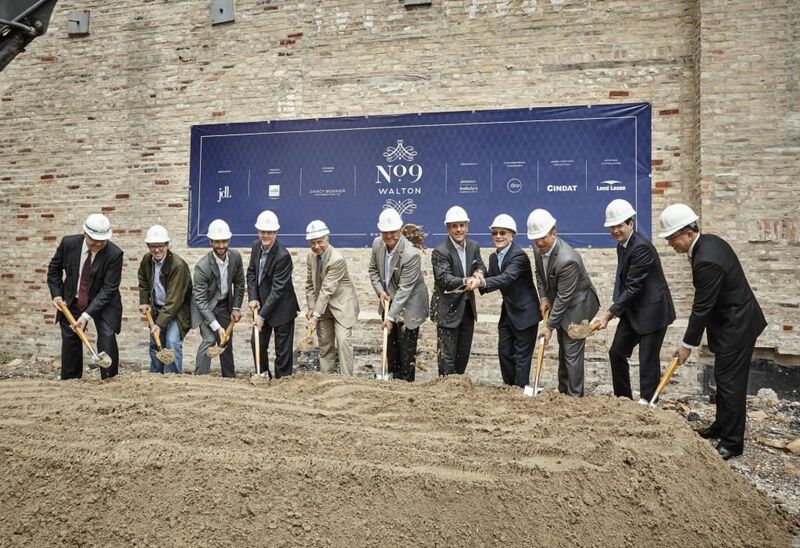 On June 29th, 2015 the development and design team celebrated the groundbreaking ceremony for the new No. 9 Walton. The opening was attended by members of the project team including project developer JDL, financiers Cindat and iStar Financial, project architect Hartshorne Plunkard Architecture, interior designer Darcy Bonner and Associates, general contractor Lend Lease, and project broker Jameson Sotheby’s. Brian Hopkins, Alderman of Chicago’s 2nd Ward, was also in attendance. The new luxury condo development is located on a prime site in Chicago’s Gold Coast and features 66 ultra-luxury condominiums, including full floor layouts and a nearly 12,000 SF penthouse. All units, ranging from two to five bedrooms, feature private terraces, 10 foot ceilings, and top of the line finishes. Building amenities include an indoor pool, hot tub, sauna, steam room, fitness center including Pilates and Yoga spaces, a private dining facility, a covered dog run, and two guest suites. The project is anticipated to open in 2017.